Escalator mishaps, elevator accidents, missing children can possibly become a common woe for most urban parents. Typical outings and carrying out chores like grocery shopping or sending clothes to the cleaners are no longer an easy task for modern parents especially when you have more than two children. Accidents involving children that include fatalities are on the rise, parallel with the rise of sky scrapping gigantic malls. Escalator mishaps, elevator accidents, missing children could possibly become a common woe for most urban parents. Earlier this week, a dishearting news broke about a four-year-old boy who lost part of his left foot while riding the escalator at KL Sentral, the same place where an 18-month-old toddler, severed her wrist after playing with the moving staircase, last year. As a parent myself, I squirm in horror when I read news or watch surveillance videos of fatal accidents involving children and escalators. As a result, I think I am developing 'escalaphobia' – the fear of escalators. But, is it right to fear this moving staircase? Or is it really a factor of negligence in parenting? The Department of Occupational Safety and Health (DOSH) reported that there were 31 reports regarding escalator accidents in Malaysia from 2011 to May 2015 with 97 per cent of victims being young children. 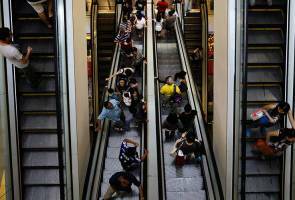 The agency also found that 2,747 escalators in Kuala Lumpur and Putrajaya had failed to meet safety standards in 2014. Not too long ago, only in the big mainland of China where we learnt of the most unforeseen mishaps that could befall on a kid (or an adult) only because child-proofing a mall is unheard of, until recently. But now, with the concrete jungle flourishing rapidly, like our cities, frightful and unfortunate events involving children can be inevitable. Accidents while riding escalators or any accident involving children can take place in a nick of time, it can happen that very minute you take your eyes off your kids and look at the chiffon tunic that you’ve been longing for so long. Or even for that few seconds when you look away and free your hands to rummage through your tote bag to answer calls or reply to messages. Most of the parents I talked to who had encountered accidents in malls and survived, said the same thing – “it all happened all so quickly”. Once in a mall, I managed to catch my son's hair when he dashed off from my clutching hands, running excitedly to take a ride on the escalator. Children see any moving form as a giant toy that they just need to give a try and so my son, did just that. It's only natural for him to get excited, he was only three at that time. After that, he didn't leave me dry from dramas. He screamed his lungs out after that. Annoyed that his mummy saved him from falling off the escalator by pulling his wavy locks. Of course, I got that disapproving stares from people who were milling around us but to me better a screaming crying safe kid than a morbid silent wounded ones. My point is, a man can make the safest escalators or elevators he can ever make or design the best kind of shoes that can’t be caught between the steps of escalator, but reality is even those grand inventions can’t quite guarantee the safety of our precious little gems. Nothing beats the undying and consistent attention from parents or guardians. What I learnt from all these cases is a parent can never be too careful when it comes to the safety of their children. To me, this is the most challenging bit about parenting. A newborn was snatched from a Florida hospital. She was just found safe - at age 18.